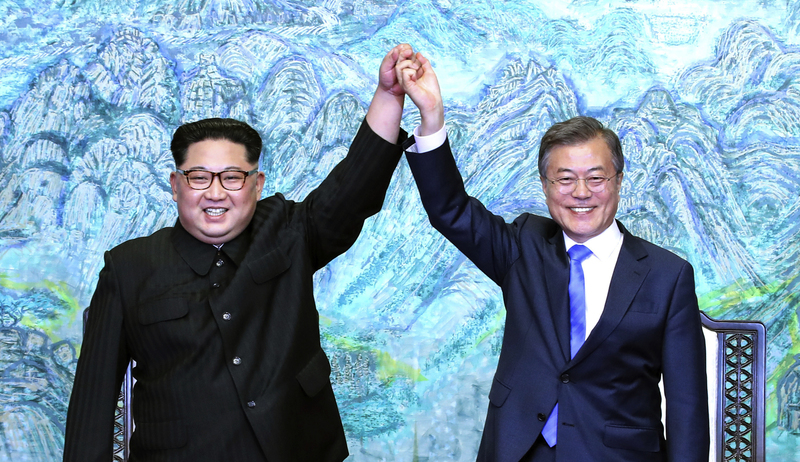 North Korean leader Kim Jong Un, left, and South Korean President Moon Jae-in raise their hands after signing a joint statement at the border village of Panmunjom. South Korea's President Moon Jae-in (left) and North Korea's leader Kim Jong Un walk together after a tree-planting ceremony at the truce village of Panmunjom on Friday. Both leaders sat down to a historic summit after shaking hands over the Military Demarcation Line that divides their countries. Kim approaches from the northern side as Moon is on the southern side of the military demarcation line upon meeting for the Inter-Korean Summit on Friday. North Korean leader Kim Jong Un, left, takes hand of South Korean President Moon Jae-in, right, to cross the military demarcation line. Kim approaches to shake hands with Moon at the border village of Panmunjom in the Demilitarized Zone, South Korea, on Friday. 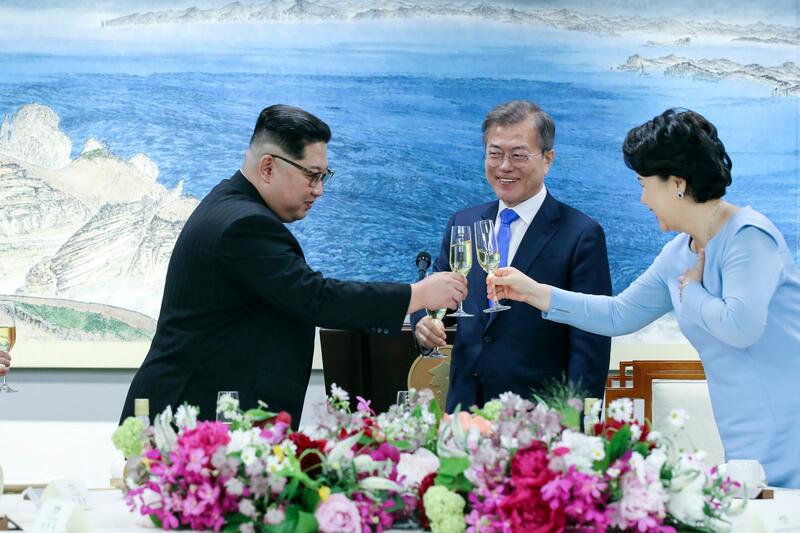 North Korean leader Kim Jong Un toasts South Korean President Moon Jae-in's wife Kim Jung-sook. Security personnel accompany a vehicle transporting North Korean leader Kim Jong Un at the inter-Korean summit. North Korean leader Kim Jong Un, left, and South Korean President Moon Jae-in, right, are greeted by children at the border. Kim and Moon walk to the official welcome hall after crossing the military demarcation line. Kim and Moon walk away after posing for photos in front of Bukhansan Peace House in Panmunjom, South Korea. 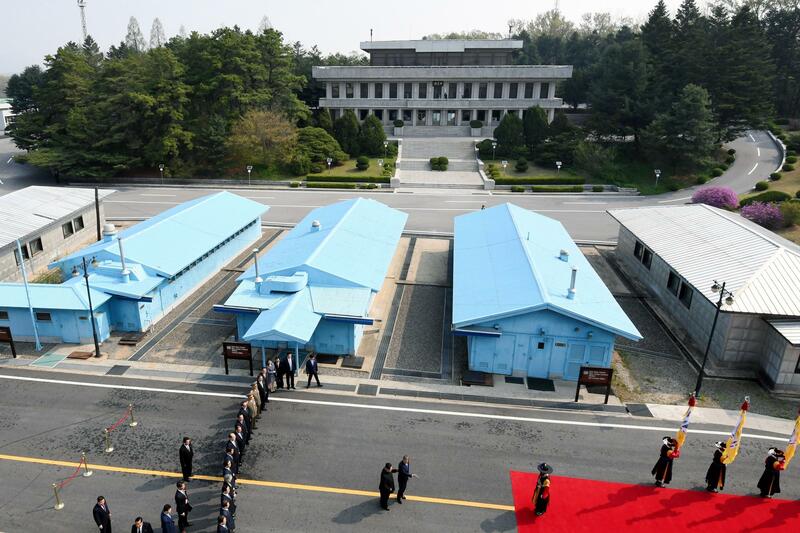 The military demarcation line where the leaders from the both Koreas met for the Inter-Korean Summit in Panmunjom, South Korea. North Korean leader Kim Jong Un, left, and South Korean President Moon Jae-in are in talks during the Inter-Korean Summit. North Korean leader Kim Jong Un and South Korean President Moon Jae-in meet in the truce village. Kim and Moon pose in front of a stone inscribed "Peace and Prosperity Are Planted" as they participate in a tree-planting ceremony next to the Military Demarcation Line that forms the border between the two Koreas. A huge screen shows live video of North Korean leader Kim Jong Un at a press center for the Inter-Korean Summit in Goyang, South Korea. Following a historic meeting between North Korea's Kim Jong Un and South Korean President Moon Jae-in, the leaders appeared side by side to make an extraordinary announcement: The two nations — technically in a state of war for more than six decades — would work toward a permanent peace treaty and the elimination of nuclear weapons from the peninsula. "I am very proud to say that I pay tribute to the bold and courageous decision taken by Chairman Kim," Moon said, saying the two sides had agreed to a peace treaty and the "complete denuclearization" of the Korean Peninsula. "We have long hoped for this moment to arrive," Kim, standing next to Moon, said. "We are not people who should be confronting each other," the North Korean leader said. "We should be living in unity." While the agreement contains lofty language, it will be up to diplomats, bureaucrats and militaries on both sides to work through specific steps to reach those goals. And the effort will require detailed negotiation between both Koreas and the United States, which could take months, if not years, to conclude. For now, the agreement mentions denuclearization but doesn't offer specific steps, which will lead to a lot of skepticism about how committed the North is given its past abandonment of denuclearization agreements. The day began with a handshake that symbolized hope that two Koreas could create a lasting rapprochement. Kim, flanked by bodyguards in matching black suits, stepped out of a building on the northern side of the village of Panmunjom, where the two sides ended the Korean War in 1953 with a simple truce, but no broader peace treaty. Notably absent in this shared security zone were the dozens of armed soldiers who typically stand guard near the military demarcation line. Two previous summits, in 2000 and 2007, were unable to make progress on the most pressing issue — the North's pursuit of nuclear weapons. The nuclear question looms even larger this time around — in the past year, Pyongyang has not only demonstrated its ability to produce such weapons but also the potential to deliver them via long-range ballistic missiles that can reach as far as the continental United States. The Blue House, South Korea's presidential residence, said the two leaders had a "frank discussion" in a morning session, which included the subject of denuclearization. A year of especially serious tensions leading up to Friday was followed by a sudden thaw and an offer by Kim in recent weeks to meet with President Trump. Mere months ago, the two leaders were trading insults and threatening to wage war. However, the White House appears to be taking Kim's offer seriously and the two men could meet as soon as next month. At Panmunjom, Kim and Moon smiled and exchanged greetings. 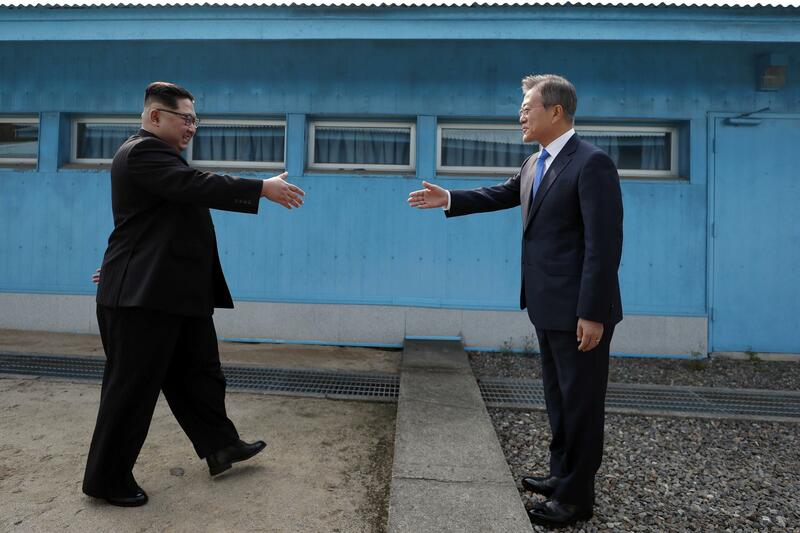 Moon, on the south side of the border, walked over to meet Kim so that their handshake could be photographed at the symbolic military demarcation line that divides the North from South. In the meticulously choreographed ceremony, hands clasped and Moon invited Kim over an ankle-high concrete barrier that divides the two countries — the first time the North Korean leader — or any North Korean leader — had ever set foot in the South. Then Kim gestured to Moon to take a step into the North, which the South Korean leader did. The presidential office later said that the unscripted moment came after Moon said he wanted to visit North Korea someday. 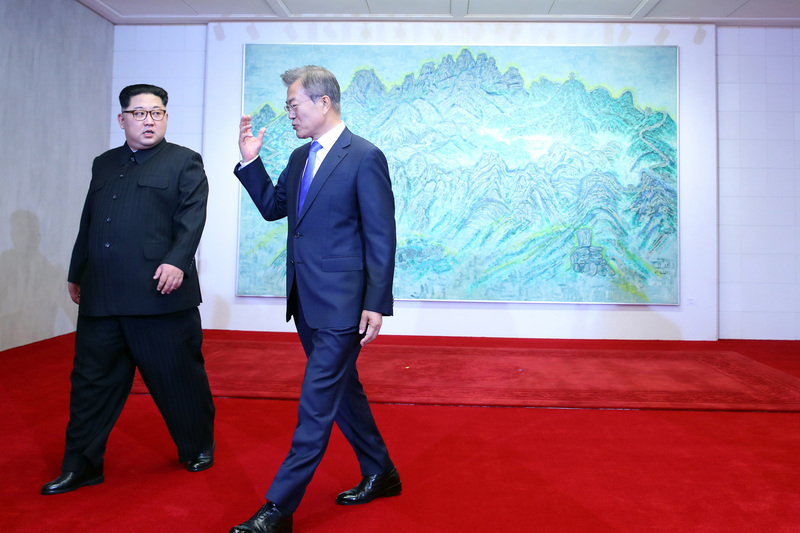 Kim reacted quickly by offering to have him step right over to the northern side for a few moments, before they crossed back over to the South, hand in hand. 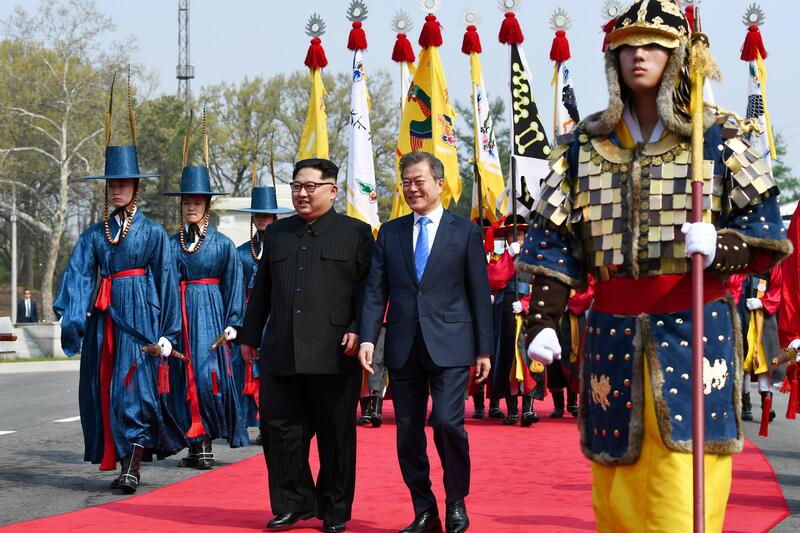 They walked side by side down a red carpet, observed a brightly-colored traditional Korean honor guard ceremony, before proceeding into the three-story Peace House for their summit. Kim and Moon continue their visit after posing for photos in front of a picture of North Korea's Mount Geumgangsan, which has special significance for all Koreans. Entering the Peace House, Kim wrote in the guest book: "New history starts from now, at the historic starting point of an era of peace." The pair posed for photos in front of a picture of North Korea's Mount Geumgangsan, which has special significance for all Koreans dating to before the Middle Ages. Kim Yong Chol, the head of North Korea's national intelligence service, began clapping and others from both sides joined in. "It feels embarrassing to be applauded just for shaking hands," the North Korean leader said, but acknowledged, "The norms are changing." "Did that make for a good picture?" he asked as journalists and others laughed. Once seated inside, Kim quipped that he brought Pyongyang's famous naengmyeon, cold noodles, "from far away," then corrected himself to say it wasn't so far away at all. The two leaders and their wives were expected to attend a dinner banquet Friday evening, featuring the noodles brought from the North. Even with the outward appearance of geniality, however, lingering suspicions were evident: After Moon stepped out of Peace House, two North Korean security guards swept into the lobby, sprayed the chair at the guestbook signing desk with sanitizer and wiped it down. They also cleaned the guestbook and pen with sanitizer — twice. Then the guards used electronic gear to scan the chair and signing desk. The reason? A South Korean security guard told reporters that their North Korean counterparts were checking for explosives and recording devices. After separate lunches, the two leaders commemorated the summit by shoveling soil around a pine tree and then sprinkling it with water from South Korea's Han River and North Korea's Taedong River. Moon and Kim then walked away from the cameras and microphones and sat at a bench to have a conversation without their aides. 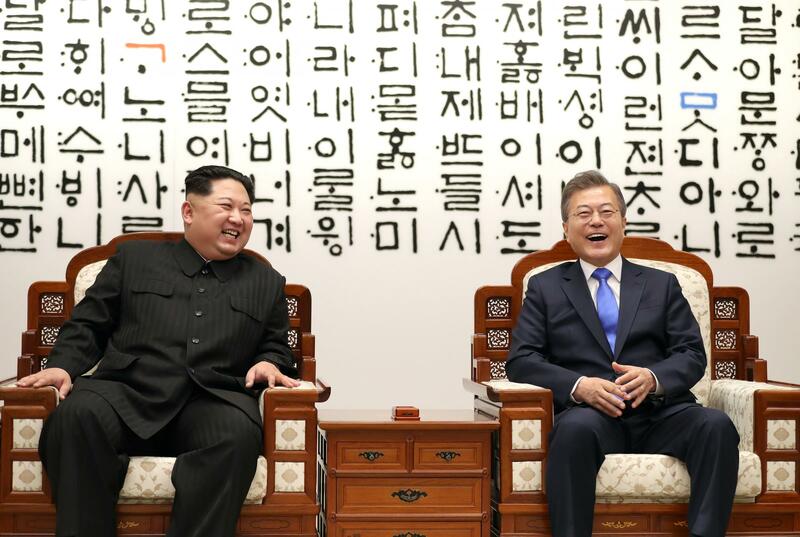 For much of that lengthy discussion, Kim could be seen listening intently to Moon, smiling and laughing at times. NPR news assistant Se Eun Gong contributed to this story from Ilsan, South Korea. The leaders of the rival Koreas have agreed to work towards formally ending the Korean War and to seek a nuclear-free peninsula. That agreement came out of a day-long and historic summit between North Korea's Kim Jong Un and South Korea's Moon Jae-in. NPR's Elise Hu was there and has this report. ELISE HU, BYLINE: It wasn't lost on either Korean leader how historic this day would be. South Korea rehearsed the handshakes and approach to the meeting room for days. And as cameras followed his every move, Kim Jong Un seemed to know his angles. SUPREME LEADER KIM JONG UN: (Speaking Korean). HU: "Did that make for a good photo?," Kim quipped to a crowd of journalists. But despite what was choreographed, seeing North Korea's leader step over the ankle-high concrete barrier dividing North and South Korea to shake hands with South Korean president Moon Jae-in still felt surprising to historian John Delury. JOHN DELURY: It's a reminder that even though you have this deep division, at the end of the day these are a common people. There was a lot of that symbolism. I think there was actually more than I expected. HU: He's a longtime North Korea watcher and professor at Seoul's Yonsei University. He says a long outdoor chat between the two men, which took place after lunch, stands out. DELURY: They reach a point where they sit together at a table, and they drink tea. And they shooed the cameramen away, and it's just the two of them. And it struck me. They speak the same language. You know, they don't need interpreters. HU: Differences that have grown since the Koreas split and recent history makes shows of unity all the more stark. Just months ago, North Korea was still ratcheting up tensions with its most powerful nuclear test and longest-range missile test yet. DELURY: We were, last year, in a place where many of us thought this was slipping toward a serious military confrontation. And that's something certainly Moon Jae-in does not want, and the South Korean people do not want. And I don't think Kim Jong Un does either. HU: Kim Jong Un pivoted to diplomacy in January. He announced last week he would shut down his main nuclear facility and said he'd maintain a current freeze on testing. By the end of the day-long summit, which featured a joint tree-planting, observing a traditional honor guard, and even a full-body hug, the two men together signed the joint Panmunjom Declaration. In it, they pledged to work toward complete denuclearization of the Korean peninsula and laid out some steps toward a potential peace deal to formally end the Korean War. They announced it standing side by side at podiums in front of the press. PRESIDENT MOON JAE-IN: (Speaking Korean). HU: ...Kim praised the shared declaration without mentioning the denuclearization part out loud. JENNY TOWN: It's sufficiently vague to not create any obligations that might stand in the way of U.S.-DPRK talks as well. HU: Jenny Town is the editor of 38 North, an online journal on North Korea policy. DPRK is an acronym for North Korea's formal name. TOWN: So I think, you know, the South Koreans did what they had to do to make this both, you know, significant and yet not too overreaching. HU: The tougher part ahead will be working with the United States on steps to denuclearize. Pyongyang has promised to denuclearize before but hasn't followed through. But Town and Delury say, in this round of diplomacy, the summit made strides. TOWN: This is the first time that they've had an inter-Korean summit at the beginning of an administration. DELURY: Today was another level of showing that Kim Jong Un is serious. I think we have to open our minds to the possibility it's really happening. HU: Both Korean leaders said they hope these were the first steps to a more permanent peace. Elise Hu, NPR News, Seoul. Transcript provided by NPR, Copyright NPR.